Ten indigenous communities. Eleven tracks & videos. One amazing album. 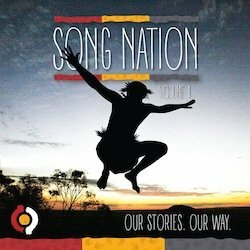 ‘Song Nation Vol.1’ is a compilation of original Hip Hop music and online videos celebrating the very much alive and vibrant Indigenous contemporary culture across regional and remote areas of Australia and Torres Straits Islands. Completely independent and unlike anything in the industry, Desert Pea Media known for their unique dialogue-driven song writing workshop process, under the cultural supervision of Aunty Gail Mabo (Eddie Mabo’s daughter) have created one of the most exciting and culturally significant albums in recent times. The Song Nation project was born from the collaboration between Desert Pea Media and The Smugglers Of Light Foundation, then evolving into a partnership program including APRA, UNLtd and a range of schools and community organisations from across the country.